With Thanksgiving approaching quickly, it's time to start thinking about menus and how to set a gorgeous Thanksgiving dinner table. And guess who is usually forgotten at Thanksgiving.... the kids! While the adults are laughing it up at the "big people" table, the kids are relegated to some lonely, small, old beat up card table in a dark corner somewhere WAY away from the everyone else. Poor little things! How are we ever going to instill that "attitude of gratitude" in them if we don't make Thanksgiving fun? Well, now we can!! 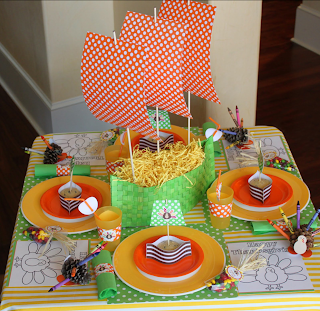 I'm on a mission to change the dreaded "kids table" and make it something really special -- a place even the adults would like to sit! With that in mind, I designed a super sweet and FREE Thanksgiving Kids' Table printable set. Yes, free! Just download the files, print them onto photo paper and with a glue gun and no time at all, you can whip up a table like this for the kids. First, the materials. Here's what you'll need to gather up. And, by the way, I didn't even go to the store before doing this table. I looked around, used what I had and just made it work. You can do the same -- be creative! Step 1: Making the ship base. Take a placemat and cut your two ship pieces from it across it's length. 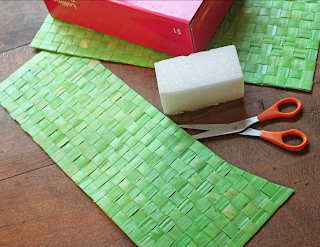 Make the ends approximately 2 inches higher than the middle, which should be about 5 1/2" in the center, 7 1/2" high on the ends. Step 2: Glue your ship pieces together. Take one ship piece and hot glue it tall the way down one of it's sides. Take your other ship piece, place it on top of the glue and press down to secure. Only glue the sides of your ship pieces. Repeat for the other side of the ship. Cut 3 dowels to 20" in length. 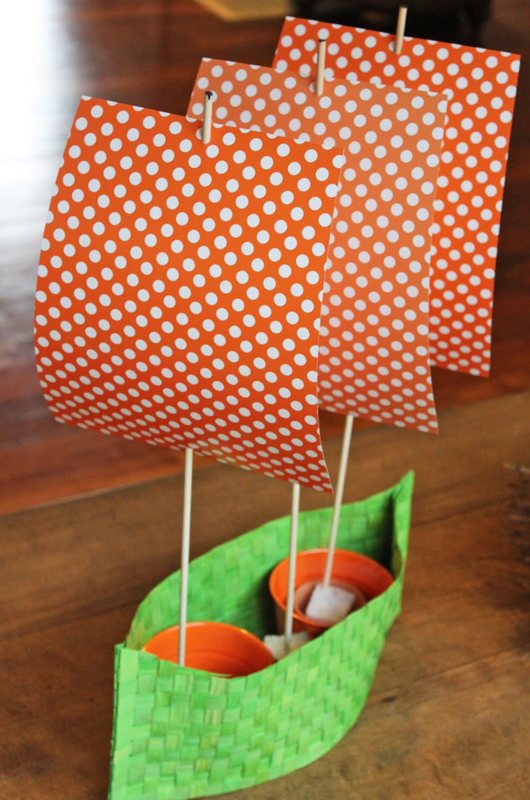 Next, print and cut 3 large ship sails from the FREE Thanksgiving kids' table set. 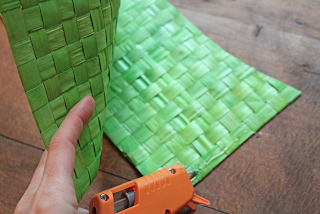 Punch a hole in each in the center of the top and the bottom and thread a small dowel through. Insert the dowel into your styrofoam, and repeat for the other 2 ship sails. Step 4: Making it pretty. It's coming together now - you're almost done! One last little step - take some shredded gift bag filler (I used yellow) and cover up all of the messy looking stuff on the inside of your boat. That's it -- wasn't that easy?? 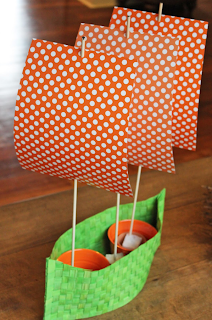 Stay tuned for tomorrow's tutorial on how to make the small ship cupcake or muffin wraps and sails. 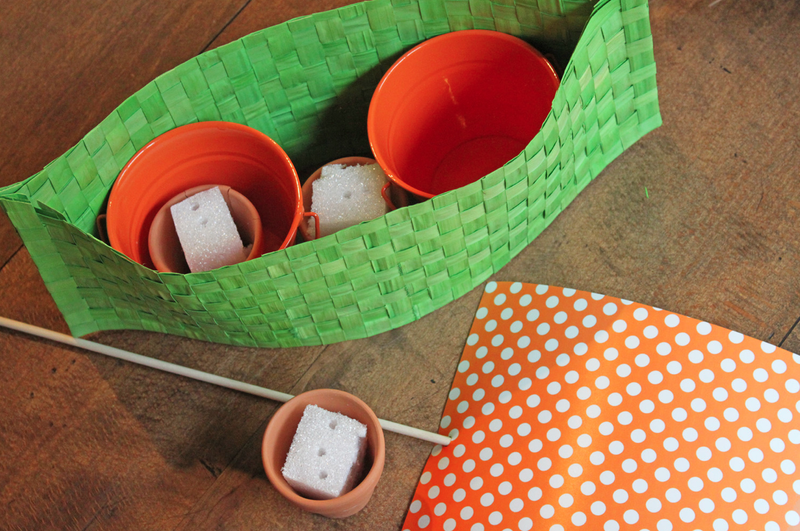 And I'll also tell you how to make that cute little pinecone turkey crayon holder. Thsnk you so much!! 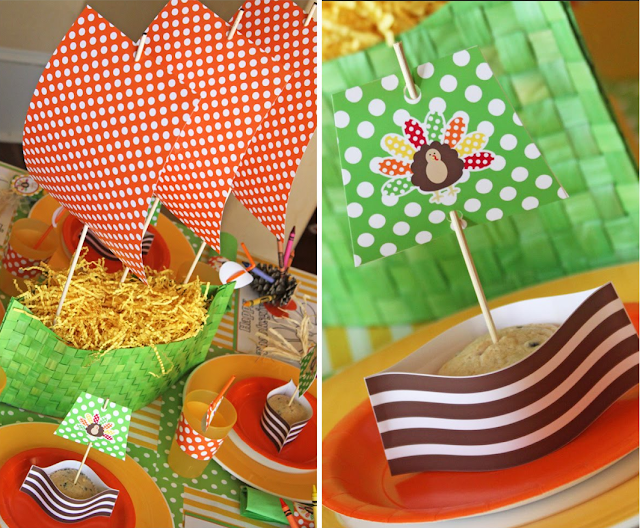 I am hosting a Thanksgiving potluck next week and this will be perfect for the kids tables!! Adorable! Thank you for this adorable set ... I was trying to download but I continue to be prompted to pay via Scribd as this file is the Archive. I was able to download your Thankful tag but not the kids set. I was just wondering if it's me or if anyone else has had this problem. Thank you! !